The Muhimba women of Angola are famous for covering themselves with otjize, a mixture of butter fat and ochre, possibly to protect themselves from the sun. The mixture gives their skins a reddish tinge. 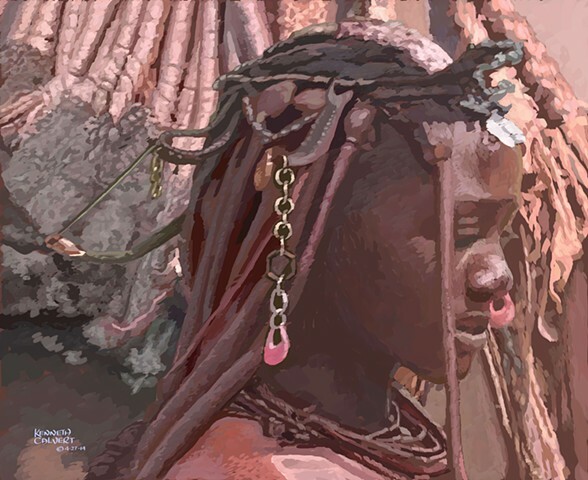 This symbolizes earth's rich red color and the blood that symbolizes life, and is consistent with the Himba ideal of beauty. Women braid each other's hair and cover it except the ends, in their ochre mixture. Married women wear headdresses with many streams of braided hair, colored and put in shape with otjize.